At Nintendo's media summit, held in San Francisco today, I had a chance to see the localized version of upcoming DS/DSi game WarioWare D.I.Y. in action. After getting a full demonstration on how it worked, my imagination is running wild with minigame possibilities. If you haven't heard yet, the D.I.Y. 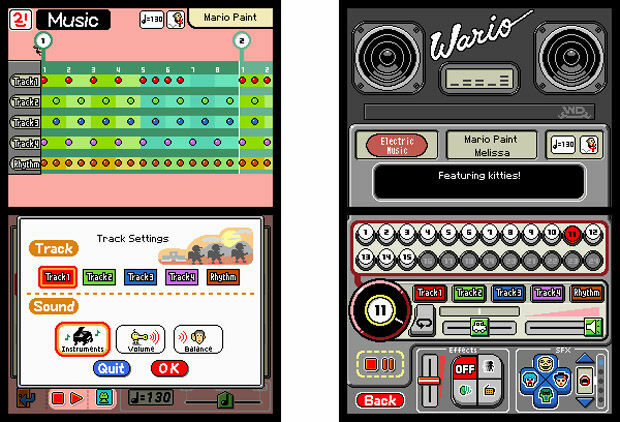 part of the game's name refers to the ability to create your own minigames to be placed in the WarioWare minigame line-up. In other words, you'll have access to the tools to create your own version of the crazy second-long games that you'd usually see in a WarioWare title. If you thought the old WarioWare games were funny, imagine one packed with all of your own in-jokes. There's almost 100 pre-made games built in to WarioWare D.I.Y., but I didn't care about any of those once I saw the game creation tools in action. Sure, you could pick from pre-made graphics and sound clips to make a game, but the creative people can stretch out and express themselves with surprisingly robust features. While the lazy will be dropping in canned backgrounds and Nintendo assets (Mario, Princess and other Nintendo-themed stamps are included), creative types will be zooming in, dropping in art pixel by pixel. The music editor is just as flexible. There's a full blown 6-track sequencer that will enable you to create your own tunes. Not as musically inclined? No worries. A built-in humming feature will try to translate your voice into a melody. No musical ability at all? An in-game Maestro can whip up tunes that fit your needs easily. After you've created your assets, you'll start to assemble them to make a game using the animator and simple scripting tools. The animation tools are really easy to use. I saw a rocket being built for a minigame, and it only took about a minute to draw and animate, complete with flickering flame coming out of the back. The final game in this example was classic WarioWare. Touch the rocket and it blasts off. Later I saw examples where more intricate art and more detailed animations were created. One example, created by someone at Nintendo, had a "just married" car driving off in the distance, with convincing cans clanking behind the car. Another was a detailed robot that needed its chest-worn switches to be twiddled to proceed. I got a better look at the simple scripting in a couple of examples. One had a vehicle that always turned right when it hit any of the walls placed on the screen. The goal was to reach a ball randomly placed on the stage. To play, the player would have to tap the ball with the stylus to remove the wall obstacle. An under-the-hood glimpse showed that there was some fairly intensive work done to make this minigame function, but it also showed me that there were solid tools there to let players be as creative as they want to be. Each of the included minigames can be "opened" to give players an inside look at how they were created, giving them solid examples of how to put their own game together. Each of the elements in these games can be copied and re-used in your own game. I saw a game that had Mario running through a Metroid world. The possibilities seemed endless. 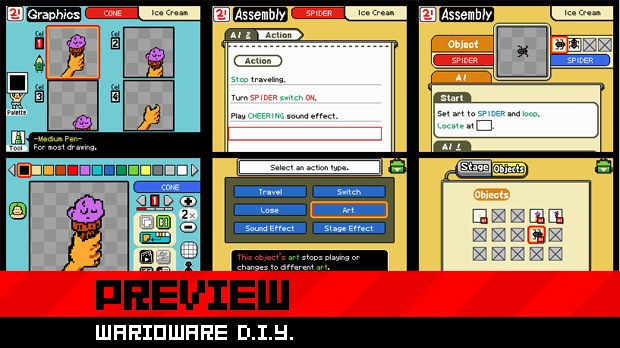 Nintendo said that they're planing to do some pretty interesting things with WarioWare D.I.Y. 's connectivity. At a base level, friends can share their creations. Creations can also be uploaded to their "Storage Crate," which will allow downloads to anyone they've exchanged friend codes with. 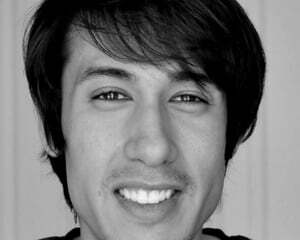 Beyond this, Nintendo plans to regularly distribute minigames made by popular game designers. They're also hoping to challenge players to create themed games; the best will be featured in their download service. A companion WiiWare title called WarioWare: D.I.Y. Showcase will give players 72 more minigames to pull into the DS game. It will also let them check out their creations on their television screen. On top of all of that, it unlocks a multiplayer mode that lets four people play competitively. Seeing the games that came out of the Japanese release had me thinking, but really getting a full look at the tools had me fantasizing about my own creations. Perverse ones. Elegant ones. Destructoid-themed ones. The ability to download and share games makes this title practically endless already, but being able to make your own minigames is like a game in itself to creative people like myself. WarioWare D.I.Y. will be released for the DS on March 28th.